It’s not often a city agency can pride itself on a homeless family intake center. These typical facilities are old, dark and while well intentioned, are not conducive to providing an overall sense of well being amongst its inhabitants. Hardly the beacon of hope for an individual or family seeking help in desperate times. The former homeless intake center (Emergency Assistance Unit) in the South Bronx, was described as “appalling and inefficient” by NYC Mayor Michael Bloomberg. The building lit by florescent lights with its dark hallways echoed the sentiment shared by its desperate visitors. Hope for a new facility meant hope for those who needed it most. The area which is less easily measured is the impact on the resident’s. The scientific community has recognized the impact of sunlight on a person’s well-being for decades. We experience a space through our senses – sounds, textures, smells and sights. By adding daylight to the resident’s environment, they heal faster, maintain a more positive attitude and are able to again stand on their own much faster. Courtesy of ©Aislinn Weidele/Ennead Architects. The 75,000 square foot Prevention Assistance & Temporary Housing (PATH) Intake center project was commissioned for the NYC Department of Homeless Services (DHS). As part of the Mayors Design and Construction Excellence program. The new facility opened its doors on May 11th 2011. This sustainable facility is more than a series of “eco-features”. From the beginning, architects and building owners considered the impact of building materials used in the facility and the impact these materials would have on its’ occupants and surrounding community. 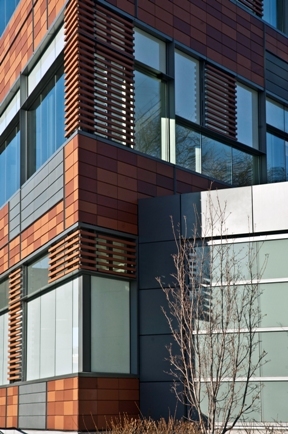 The facility’s terracotta tiles reference its neighborhoods residential brick architecture. The zinc and metal trim acknowledge the neighborhoods industrial aesthetic. Ennead Architects wanted to introduce glass into the facade. However, they had to address the challenges of poor light penetration, glare and thermal inefficiency traditionally associated with glass. They were able to overcome these challenges with the incorporation of Solera Translucent Glazing Units into the facade, providing both transparency and luminance. The new facility greets its visitors with an abundance of natural sunlight that is cool, diffused and comfortable. Evidence of the positive impacts of daylighted spaces is well documented. The results were applauded by both city officials and visitors. The PATH Center is a 24/7 facility, and its Solera light diffusing panels not only illuminate the interior of the building during the day with natural sunlight, but also generates a gentle glow on the building at night and is a beacon for those seeking shelter and support. The PATH center in New York can boast a number of accolades including; a 2006 Public Design Commission Award for Excellence in design. In addition, the project is designed to achieve LEED Silver. “The new Prevention Assistance and Temporary Housing facility was designed to provide compassionate and efficient services that had not previously been offered by the City,” said Mayor Bloomberg. Advanced Glazings was proud to support Ennead Architects (formerly Polshek Partnership LLP) on this project. Our assistance extended beyond the team’s expertise in daylighting, conducting daylighting simulations to ensure that the appropriate levels of daylight were designed into the project. The light diffusing properties of Solera L used in the PATH building. Allowed natural daylight to penetrate deep into the space providing even illumination from both the North and South facades. The elimination of glare enhances not only the comfort of visitors but also the productivity of workers in the space. Advanced Glazings Ltd. worked closely with the architect, construction managers and glazings contractors . The project was delivered on time and on budget. While the total cost for the facility was budgeted at $75 million, it came in under budget at $65.5 million, a testament to the whole team. The P.A.T.H center is now a beacon of hope.